Highlights: Two major spice plantations that produce exotic spices and grind them in a powder form for use. How to Reach: Ponda can be reached easily from Panaji by hiring a taxi or an auto. You can also hire a private van or jeep to reach the spice plantations of Goa. Goa is synonymous to its exotic beaches and pulsating nightlife. Tourists come here to enjoy the relaxed pace of life and rediscover themselves in peaceful and serene surroundings. But there is more to Goa than just beaches, churches, nightlife and casinos. 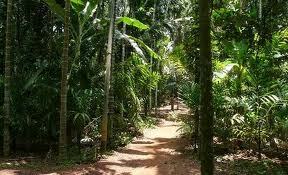 A major attraction in the rural side is the spice plantation of Goa. Situated in the region called Ponda (central Goa), the spice plantations in Goa use organic methods of cultivation and farming. The spices that are produced are then cleaned and ground into powder. Apart from these spices, many tropical fruits are also grown here that include Custard apples, Papaya, Bananas, Pineapples, Citrus fruits, etc. Information regarding the major spice plantations is given in the following lines. Located at a distance of just 2 kilometers from Ponda, the Sahakari spice plantation is famous for its farms and grows many fruits. One of the most unique spices grown here is vanilla. The farm is spread over 130 acres and also has two small streams flowing right through. This spice plantation is located on high mountains amidst stunning surroundings near Ponda. Many tourists visit the Abyss spice plantation as it is famous for the medicinal herbs that are grown over here on a large scale. This spice plantation is located at a distance of around 10 kilometers from Ponda. The main spices grown here are cinnamon, cloves, cardamom, turmeric, ginger, basil, nutmeg and pepper plantations. The cashew distillation unit is an added attraction here.